For my fellow artists -a few things I may have learned the hard way so that you can save time and energy. iBooks Author is a phenomenal yet (sometimes) extremely frustrating piece of software. In typical Apple fashion, menus and options have been simplified to the point where flexibility appears to be lost. In the end though, iBooks Author will do most everything you want it to; it just takes a bit of finesse and trial and error. This post focuses on the creation of art/photo books that require full screen display of images at high quality levels on retina display iPads. Here is what I have learned when it comes to formatting this type of images for iBooks Author. Don’t believe what you read: there is an immense amount of misinformation about image formatting for iBooks Author. Apple itself seems to confuse the issues with their rather vague or imprecise answers in their users forum. To center your images and display full screen, use the following parameters in the metrics panel of the Inspector: size at 1024 pixels in width (this will automatically adjust the height to 748 pixels) and position at zero for both the X and Y axis. Let’s look at a few of these guidelines in more details. The only parameters you need to concern yourself with are the Width and Height in pixels. Resolution is irrelevant -you are sizing your image in absolute terms (pixels). For your cover page, you will want to size at 1004 x 768 pixels. Sharpening: to my surprise, sharpening images for use on iPads (including retina displays) doesn’t appear to make any noticeable difference except at maximum zoom in levels. After many tries, I now skip sharpening altogether. Your results may vary depending on the type of images you are using, but I would advise doing a quick test with and without sharpening before you settle on a final workflow for image treatment. Image type: while JPEG is the recommended file format, you can save your files as PNG if you need transparency. Note that iBooks Author gives you tools to both modify the opacity of and apply transparency to a JPEG . You can find more information on full screen images for iBooks Author in this blog post by Davide Barranca. For you book cover, the following post provides a few design tips based on my experiments. Great post, but I’m hoping you can clear something up for me. I’ve just started my second book on iBookAuthor and this time I’m preparing up front with image size requirements etc. When I use your dimensions – 1024 by 748 in iBookAuthor, my image doesn’t fit exactly. It would appear that the correct size is 768 by 1004 (I’m working in portrait, not that this should make a difference). Also, I’m confused over the unit pixel vs point. iBook refers to points, but I believe it is a pixel dimension it is actually using (1 px is 0.75 pt, which creates quite a difference as you get to 768) – any comments/thoughts. – Your book cover should be 1004 x 768 pixels. I quote everything in pixels -points are a measure of length (72 points equals one inch) and you need a set resolution to be able to convert points into pixels. At 72 pixels per inch (ppi), one point is equal to one pixel; however the iPads have screen resolutions up to 224 ppi. I hope this answers your questions.. good cartoons btw! Thank SO much for this logical, handy, and simple explanation of the dimensions required. 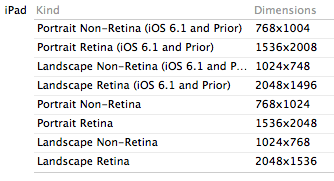 I had that experience you’ve mentioned, with Apple being just too vague when it came to all the details. I had searched the net before finding your post…I wish I found you first! Every time I try to change the dimensions of the image in both photoshop and the inspector, I’m never allowed to choose your recommended pixel sizes. When I put one size in the width, the height automatically changes to a size that is not recommended by you. How do I get around this? Also, I am working in portrait mode. Can you please verify for me the proper dimensions for a full page image in portrait mode? I’m a little unclear about that in your article. Brendan, since you have the “Constraint proportions” box checked, and your image doesn’t have the correct ratio of width to length, modifying one dimension will not set the remaining dimension to the correct value. To resolve this, open the image in Photoshop and set it to the correct dimensions using the crop tool. For portrait, use the same dimensions than for landscape, except reversed. Love your work! And your generosity to share this ibook info – Thank you! I have a question regarding the cover image for ibook. I have a .jpg cover that has the name of title of the book hand drawn within the cover illustration. It would be redundant to type another one in the text field. If I don’t add title text (letting the illustration speak for itself) on the cover will it be a problem? I don’t think it’s a problem not inserting the text field for your title. Also, remember that you always have the option of leaving the text field for the book title but making of a color and size that will be invisible over your artwork. Merci Jean – Apple needs to have this info – they don’t provide enough detail like you have! Your pixel dimensions for screens is correct. 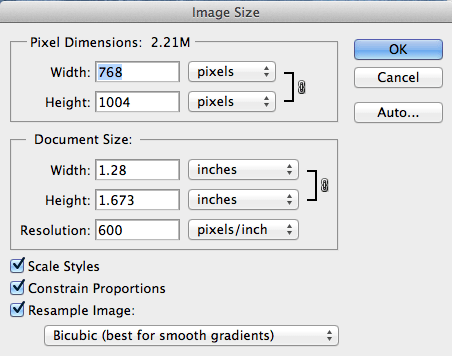 But the dimensions for iBooks Author are in points not pixels due to it being a document creator. So for instance the book cover at 1004 x 768 is points (pt) if sizing it first in photoshop. 1004 x 768 in pixels is only 241 x 184 points. If you size something 1004 x 768 points it will be 4183 x 3200 pixels. Confusing but simple in photoshop. 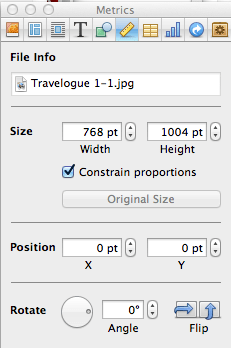 Use the above numbers and change the tab under image size to points. You can in iBooks Author drag an image fill box to the desired size and dimensions in points will appear by the curser. 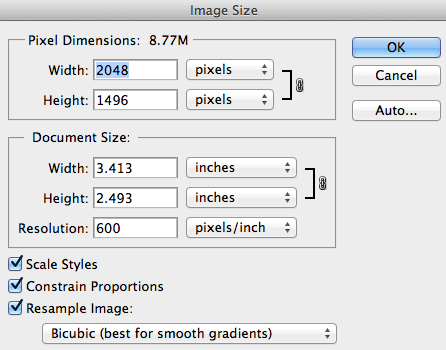 Size your image in photoshop to that exact point size. 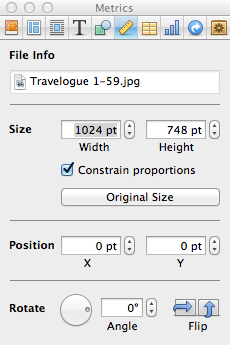 If you’re doing this with the sizes for instance of 1004 x 768 in pixels they will be 4 times smaller than they should. You can prove this to yourself by dropping an image in as original size.